When it comes to vendor events I am asked all the time what the best way is to book parties AT the event. Sure you can do follow up and get great bookings that way – but how can you entice people to want to book a party right then – so you leave every event with a full calendar? Here is my favorite Booking Tool that I used for years at all of my vendor events that you can make for around $30 with products found at your local discount store. Choose products that are great – but at a price point that you can offer for a giveaway. Using a small piece of tape on the back, place each image over a colored circle. Using tape on the back, secure the construction paper to the spinner. Then using either markers or your computer printer, add in four additional bonuses where the hand/foot actions were. You can also add in pretty stickers, swirlies, or other festive decorations to make it more appealing. Cover the entire spinner with strips of packing tape – laying the strips side by side to not overlap – you want it to be as flat as possible so that the spinner will easily spin around. Lastly, press the ink pen through the center hole, and securely fasten the plastic spinner. 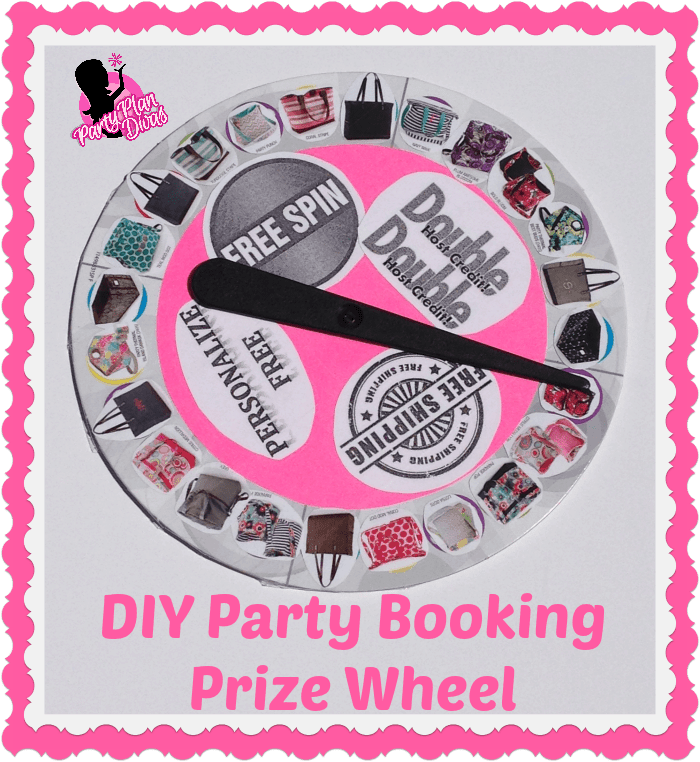 You have a pretty, inexpensive Booking Prize Wheel which will last for years to come!